Lammerside deserved another visit...I haven't been there since December 2005....and this time the weather, although cold, was much better. The earthworks also look more defined, the grass was just the right length. The above photos shows the earthworks that now show where the surrounding barmkyn or curtain wall would once have run. This view shows the earthworks at the South side of the tower. They run from right to left, and continue right up the hill (out of shot) and would originally have surrounded the whole complex of buildings. At the top of the hill, the buried footings are surmounted by a modern fence, re-enforcing the medieval boundary. 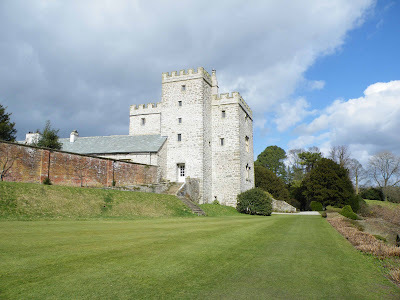 The photo above, shows the tower looking from the West, at the top of the hill. The earthworks in the foreground, are thought to be the remains of an ornamental garden, probably placed here to give the viewer the best panoramic views of the tower and its attendant buildings, and Nateby Common. The fence, sitting on top of the medieval boundary, can just be seen to the left. The photo above, shows the hall, looking at the Southern wall. The earthworks in the foreground would have been a substantial building, with thick walls, that would most likely have butted up against the now exposed face of the tower. This photo shows a view from the first floor of the tower. The collapsed floor can just be seen in the foreground. View of the South East corner of the tower. This photo shows just how much of the cladding has been destroyed or removed over the years, exposing the rough rubble from which the tower is constructed. My favourite site, probably in the whole of Cumbria...Pendragon is isolated on the best of days, but with a cold wind blowing, and squally showers and bleak grey skies, it's all the more spectacular and yet lonely. 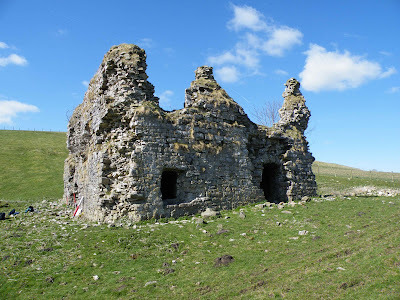 This visit yielded some glimpses into the defences employed by its builders that made this building a safe haven in such a bleak and lonely landscape. 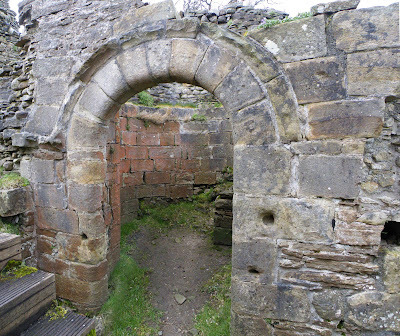 First of all, the doorway in the castle's North facing wall. There are no less than three levels of security on this entrance. The first, seen on the left of the door jamb (above), and the right of the door jamb (below) The series of deep holes would originally have had metal hinges leaded into them securely, from which a heavy door would have hung. The next two photos show the draw bar slots and the groove in which the portcullis would have run. The draw bar slots would have secured yet another door, and the portcullis would have been the external security for this entrance. The photo above, shows the East door jamb. The draw bar tunnel in this jamb is fairly shallow, perhaps around 4 inches deep, and rectangular in shape...however this may be due to a missing stone from it's lower lip. 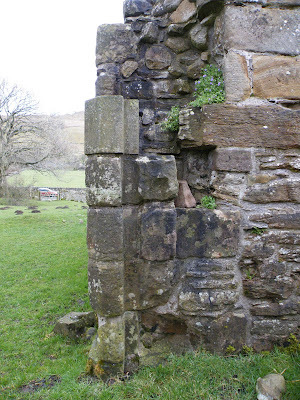 The portcullis slot can also be clearly seen on this jamb, running from top to bottom of the outer lip of the door jamb...although the interior guiding lip has been chipped or eroded away. The photo above, shows the West door jamb, again with the draw bar tunnel and the portcullis slot....this time much better preserved. The draw bar tunnel in this jamb is perhaps a foot deep. 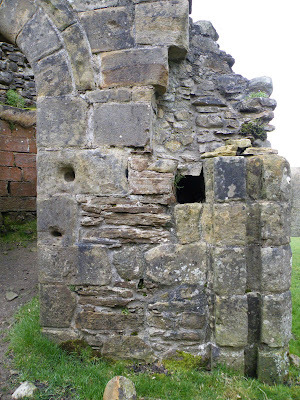 The portcullis slot runs from top to bottom and looks almost complete. There would most likely have been a room above part of the doorway from which the portcullis could be raised and lowered. 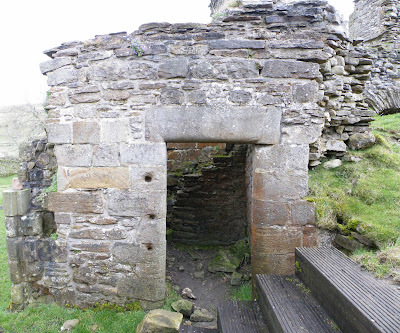 The photo above shows the remains of the gatehouse. Most likely the site of the Countess Gate, this would have been the only way over the deep moat that runs almost the full circuit of the castle's mound. These earthwork remains are situated on the East side of the site, next to the modern causeway that now provides easy access to the castle. The mound in the centre of the photo, probably marks the last remains of buried footings of the gatehouse, and the area to the left of this, in front of the modern wall, would most likely have been an outer courtyard area. The photo above shows the deep depression in the moat where the gatehouse's deep cellar would have been (just to the right of the modern causeway) You can just make out the buried masonry marking the spot the gatehouse would have occupied. 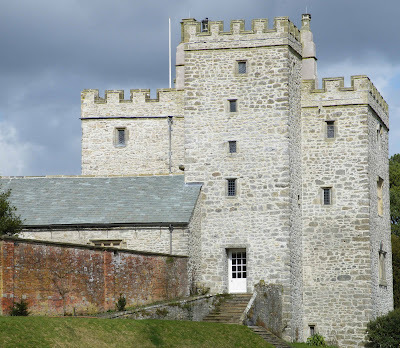 It's now thought that Lady Ann Clifford had the castle rebuilt and refurbished as a Summer retreat, with her ancestors using it as a hunting lodge....the security built into its fabric to make sure that local families, such as the Warcops and the Whartons, did not enter un-invited. 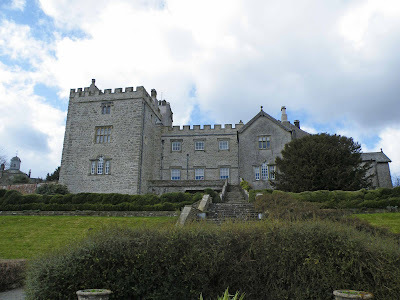 There seems to have been a long running feud between the Cliffords, the Whartons and the Warcops regarding park boundaries, with all three families laying claims to large areas in the region. This is one of the intriguing sites with little history available to tell. Sited some two miles South West of Kirkby Stephen, just off the A685, the earthworks here are only really visible if you stop and take a 'slide' down the embankment. Once you've found them however, they're quite impressive. The site consists of a range of banks and ditches, and may represent the remains of a medieval moated manor. The Southern extremes of the site have undoubtedly been buried beneath the houses here, whilst the Northern extremes of the site have undoubtedly vanished beneath the bank upon which the A685 now runs. The site is very large, covering all of the fields between the houses and road with an estimated width of around 120 feet and a total overall length of around 180 feet. The ditches and embankments are very well defined, some of them up to 4 feet deep in places. 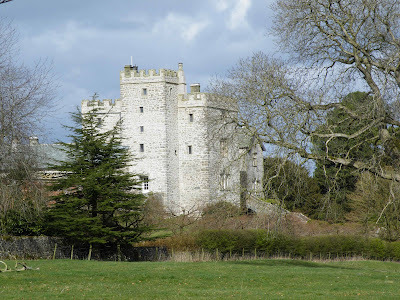 The remains are described as a moated site, or a motte with a gate, by Pastscape, and may represent the remains of a manor dating from before 1150. 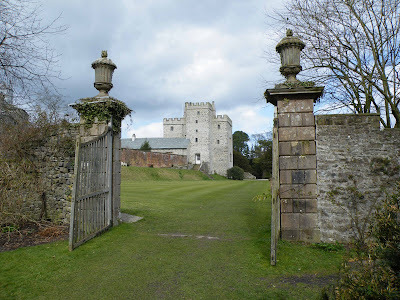 Philip Davis of the Gatehouse website labels this site as a 'questionable' fortification.....but whatever the history connected with these remains, they represent something fairly major. Of course...there is always the possibility that these remains represent nothing more than the remains of a medieval garden that was built in the area. Interestingly, there are a number of dykes and earthworks to the North of these remains. Clearly marked on the ordnance survey map, and just discernible on aerial photos, they seem to represent the remains of either dykes or hollow ways. There are also a number of 'pillow mounds' (rabbit warrens), visible on aerial photos, positioned a few hundred metres to the North of the Ravenstonedale earthworks. 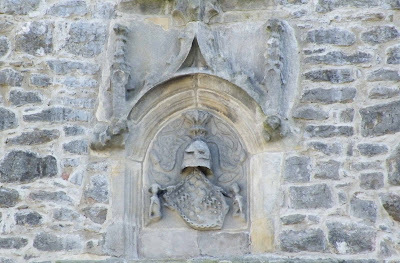 Could the presence of these warrens indicate the presence of a manorial centre in the area? The area was once clearly emparked....the sheer number of pillow mounds still surviving and visible, would indicate that this was certainly the case. It also lends strength to the argument that the earthworks shown above, are in fact fish ponds....similar to the set up at Lammerside, where an emparked area also contains both rabbit warrens and fish ponds. As more information is discovered, it will be posted here. Click on the photos for full size versions!